Join Us!!! We are looking for someone to help us cover Lebanese basketball. Please send us an e-mail. Al Riyadi outgunned Champville to ensure LBL Finals berth. Al Riyadi outrebounded Champville 44-33 including 29 on the defensive glass. Worth to mention a great performance of naturalized Egyptian power forward Ahmad Ismail (205-76) who helped to win the game recording a double-double by scoring 11 points and 19 rebounds. American forward Justin Brownlee (197-88, college: St.John's) contributed with 19 points and 6 rebounds for the winners. Brownlee is a former Eurobasket Summer League player, which is considered top international summer league in the market. The former international forward Fadi El-Khatib (198-79) replied with 23 points and 6 rebounds and American forward Dewayne Jackson (203-90, college: Morgan St., agency: Higher Vision Sports) added 10 points and 8 rebounds in the effort for Champville. Beirut Club upset Homentmen on the road to advance into the championship series. Beirut Club made 21-of-26 charity shots (80.8 percent) during the game. It was a great shooting night for Beirut Club especially from behind the arc, where they had solid 52.4 percentage. Worth to mention a great performance of American point guard Justin Dentmon (183-85, college: Washington) who helped to win the game recording 27 points and 4 assists and the former international forward Ali Haidar (201-90, college: Michigan Tech) who added 14 points, 10 rebounds and 4 assists during the contest. At the losing side U.S. Virgin Islands-Puerto Rican point guard Walter Hodge (183-86, college: Florida) responded with a double-double by scoring 24 points and 13 assists and Nigerian-American guard Michael Efevberha (193-84, college: CS Northridge, agency: Octagon Europe) scored 25 points. Five Beirut Club and four Homentmen players scored in double figures. Champville toppled Riyadi to cut the deficit at 1-2. Champville outrebounded Al Riyadi 48-31 including a 22-7 advantage in offensive rebounds. It was a great evening for the former international forward Fadi El-Khatib (198-79) who led his team to a victory scoring 19 points and 8 rebounds. The former international swingman Ahmad Ibrahim (198-92, college: Rice) helped adding 14 points and 9 rebounds. The best for the losing side was American forward Justin Brownlee (197-88, college: St.John's) with 20 points and 8 rebounds and the former international point guard Wael Arakji (194-94) scored 16 points and 6 assists. Beirut Club stormed past Homentmen to open 2-1 advantage. Beirut Club made 16-of-20 free shots (80.0 percent) during the game. It was a good game for the former international forward Ali Haidar (201-90, college: Michigan Tech) who led his team to a victory with 23 points and 6 rebounds. The former international power forward Charles Tabet (205-87, college: S.Alabama) contributed with a double-double by scoring 10 points and 17 rebounds for the winners. Four Beirut Club players scored in double figures. U.S. Virgin Islands-Puerto Rican point guard Walter Hodge (183-86, college: Florida) answered with 16 points and 4 assists (went 12 for 12 at the free throw line !!!) and Nigerian-American guard Michael Efevberha (193-84, college: CS Northridge, agency: Octagon Europe) added 13 points and 5 rebounds in the effort for Homentmen. The winner was already known earlier in the game, so both coaches allowed to play the bench players saving starting five for next games. Riyadi held off Champville to take 2-0 lead in the series. Naturalized Egyptian power forward Ahmad Ismail (205-76) orchestrated the victory with a double-double by scoring 16 points and 10 rebounds. 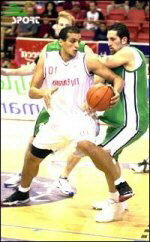 The former international point guard Wael Arakji (194-94) contributed with 16 points and 4 assists for the winners. American guard Demarius Bolds (193-84, college: Missouri Western) replied with 17 points, 5 rebounds and 5 assists and his fellow American import forward Dewayne Jackson (203-90, college: Morgan St., agency: Higher Vision Sports) added 13 points and 11 rebounds in the effort for Champville. Beirut Club drew things level versus Homentmen. Beirut Club made 20-of-25 charity shots (80.0 percent) during the game. Beirut Club outrebounded Homentmen 44-31 including 32 on the defensive glass. The former international forward Ali Haidar (201-90, college: Michigan Tech) had a double-double by scoring 29 points and 11 rebounds to lead the charge for the winners and American guard Chris Crawford (193-92, college: Memphis) chipped in 12 points and 7 rebounds during the contest. Four Beirut Club players scored in double figures. U.S. Virgin Islands-Puerto Rican point guard Walter Hodge (183-86, college: Florida) responded with 35 points (!!!) 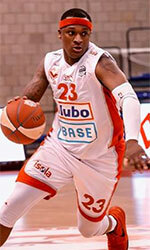 and 8 assists and the former international forward Patrick Bou-Abboud (199-87) scored 7 points and 12 rebounds. Homentmen's coach Joe Nebhan rotated ten players in this game, but that didn't help.